2017 is the 30th anniversary of Domestic Violence Awareness Month (DVAM)! 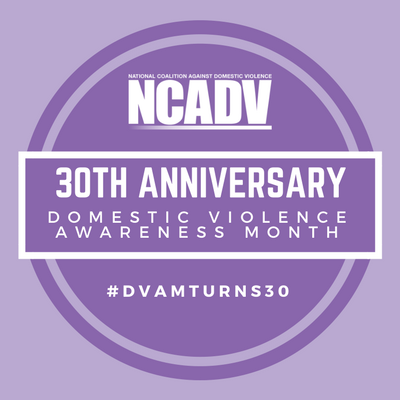 Launched nationwide in October 1987, DVAM has connected and united individuals and organizations working on domestic violence issues and helped to raise awareness for those issues. Over the last three decades, much progress has been made to support domestic violence victims and survivors, to hold abusers accountable, and to create and update legislation to further those goals (NCADV, 2017). The Advocacy Center has a number of events and initiatives throughout the month of October to raise awareness of domestic violence within Tompkins County. Keep your eyes peeled while walking around downtown Ithaca and throughout Tompkins County to see one of our Purple Ribbon Rocks! If you find one take a picture with it and post it to your Facebook, Twitter or Instagram to show your support for ending domestic violence! Be sure to tag us @AdvocacyTC and follow our pages while you’re at it. Shine the Light on Domestic Violence– Go Purple! Grab your favorite purple scarf, pants, shirt, hat, skirt– anything really– and join others around NYS in going purple to raise awareness and show support for survivors of domestic violence. With your purple on please join us at one of the following events during the day and then at our Founding Mothers Screening that evening! Check out the purple lights in the main building, the Clothesline Project Display in the Library and visit our resource tables from 8:30-10:30 in the Main Stairwell and 11-1 in the cafeteria to show your support! Gather at 10:45 am at the main entrance for a picture of everyone in their purple! Community Gathering, 11:30-1 Willard Straight Hall Memorial Room. Speakers, resources, deserts and an opportunity to support the Cornell CARE Fund which domestic violence victims can access. Be sure to stay for a special concert by the Cornell Chimemasters Concert, beginning at 1:10pm. IC Fountain is Going Purple! Be sure to go see the fountain turned purple in honor of Domestic Violence Awareness Month. Founding Mothers Screening: A Celebration of 40 years! In our continued celebration of offering Domestic Violence Services in Tompkins County the Advocacy Center in conjunction with The History Center will be presenting a screening of Our Story, a brief documentary highlighting the dedication and powerful local women that came together to address an issue that was expected to be kept in the shadows. Entrance is free and light refreshments will be provided. Wizards, Witches and Muggles alike are invited to visit us during Wizarding Weekend to find out how to join Dumbledore’s Army and bring along a pair of new socks to be donated to people fleeing abuse in our domestic violence shelter and free some house elves along the way. Our Youth Educator will continue to be in school classes educating students about ways to recognize and respond to abuse they or their friends may experience and about relationships. Resources and information will also be presented through bulletin board displays and supporting youth led organizations in raising awareness among their peers. Show your support for survivors through your social media this month! Follow the Advocacy Center (@AdvocacyTC) on Facebook, Twitter, and Instagram to see what’s happening and participate in our campaigns. We also have a brand new Twibbon you can use to show support all month!